The client is in the business of research and developing and providing tools for overcoming the sleep related disorder through Cognitive Behavioral Therapy, a highly effective treatment for insomnia. The purpose of this project is to provide online treatment of insomnia patients through automatic consultation and recommending suitable course of action. The treatment of insomnia patients is based on Cognitive Behavioral Therapy, a highly effective treatment for insomnia. PROCESS: The treatment of insomnia patients is based on Cognitive Behavioral Therapy, a highly effective treatment for insomnia. The software logic is developed in such a way that the consult is prepared and shown to the consultant. In case the consultant wishes to modify the treatment, he can just select or de-select the text templates and submit the page. To achieve the automatic prepared consult based on the sleep diary filled by the insomnia patient for a period of seven days. To develop the logic to include the complex calculations to calculate the average, median and standard deviation of variables like time to go to bed, time to get out of bed etc. To display the difference between the two consults. To display the weekly sleep pattern graphically. 1.2 How was it achieved? The logic was designed and developed at STPL to calculate the mean, median and the standard deviation of various sleep variables. Graphical presentation of sleep pattern was achieved by taking into account the sleep latency time, awakening minutes and other sleep timings. Classes were created to display them in the form of bar graphs as against standard bar. Logic to select or de-select the appropriate consult text templates based on the sleep diary data was implemented. The consultant is presented with a pre-prepared consult. The consultant has to just select or de-select the check boxes adjacent to the text templates and the consult gets modified. There is graphical presentation of the sleep pattern which makes the patient as well as the consultant understand the patient’s sleep details. The consultant can view the difference between the sleep data of two diaries. Very helpful system to provide online treatment / consultancy to the insomnia patients which is convenient to both ie the consultant as well as patients. The efficiency of consultant is increased many folds and he/she can provide treatment to large no. of patients in a short time. 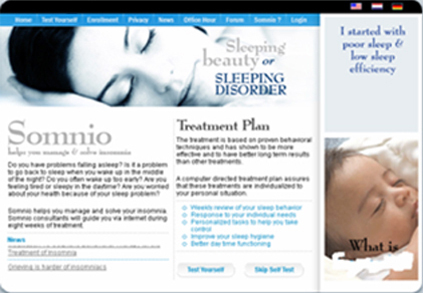 Patients globally can get treatment of insomnia online. Flash technology is used to display the self test and sleep interview modules for the analysis of sleep pattern of any visitor. Display questions dynamically on the flash component. Design a visually attractive flash component with various controls for entry purpose along with proper validations. Display intermediate and summarized results depending on the questions answered in the two modules. 2.2 How was it achieved? Proper expertise in flash scripting was used to design the flash component which suited the client’s requirements. 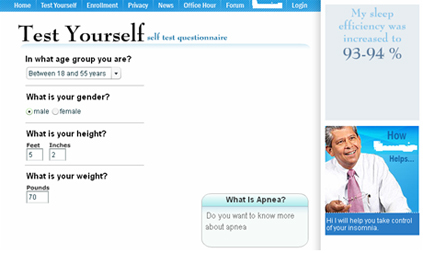 Brainstorming and innovative ideas led to achieve the desired features of self test and sleep interview modules. Expertise in XML was used to fetch the questions dynamically on the components. Logic was used to display the intermediate as well as the summarized results. The modules are attractive enough to have more and more visitors for the site. Ease of time entry in the sleep interview module. The questions and the results texts can be edited online via the XML editor. To provide online editing of the site contents in a secured way so that editing and manipulating site texts become much easier and quicker and the reflection can be viewed on the site in just a single click. To create proper XML files to store various editable texts in the form of different nodes. To provide the editable texts in the form of tree view interface to the admin user. To reflect the changes on the site done via editing the XML. To save the edited XMLs in proper format. To implement security for using the online XML editor. 3.2 How was it achieved? The latest technology provided in the dot net framework version 2.0 was studied and XML nodes are created in the form of tree view. On clicking the proper node on the left side of the tree view, its text gets displayed at the right side and the changes can be done by editing the text. A Save button was provided, clicking which the edited XML gets saved. Another button was created, clicking which the XML files storing the site contents would get loaded again and the reflection could be seen by viewing the appropriate pages. Brainstorming lead to the evolution of the desired logic to provide login page in the administrator module at a common place to implement the security. The client can edit then and there any content used in the site. The complete site is dynamic and any change required can be implemented in no time. The site contents are presented in an easy and understandable format in the form of a tree view. To architect code is such a way that any version of Sleep Study Portal can be implemented easily and the code is easy to maintain. To show the controls, page titles, site content, images, navigation buttons dynamic depending on the version selected. To store various site contents in properly managed folders. To achieve the path to view various controls dynamically in the form of XSLT and in the images source. 2. How was it achieved? The site configuration file "web.config" was modified and keys were created to store the version flags and paths for images, user controls, XMLs etc. Various folders were created to store the images, flash components, style sheets and XML of different versions. Login page in the administrator module at a common place to implement the security was implemented. The speed of application improves. The client's requirements or changes can be easily deployed. The client is presented with a clear picture of the code architecture.